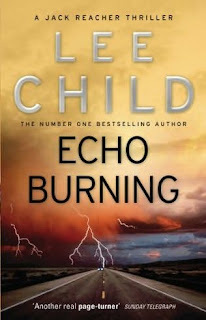 Echo Burning is the fifth novel in the "Jack Reacher" series by Lee Child. I'm OBSESSED with this series, and figured I'd better write up and post the review for Echo Burning before I read the sixth book and they all start blending together. Somewhere in Texas, in the middle of the scorching summer, Jack Reacher finds himself hitchhiking along a deserted stretch of highway. Not expecting anyone to pick him up considering his intimidating 6'5" muscular physique and rough persona, Reacher is surprised when a beautiful, petite young Hispanic woman named Carmen Greer pulls over and offers him a ride. As they start to drive, Reacher learns that Carmen Greer has been searching for a man just like Reacher to fulfill a devious plan - a plan that involves the assassination of her abusive husband and an escape from a meddlesome upper middle-class and very racist white family. Unwilling to be a part of Carmen's crazy and poorly thought-out plan, Reacher puts his military detective experience to the test and soon realizes that there's a lot more going on than just Carmen's plan to kill her husband - and that he's now part of the plan whether he likes it or not. 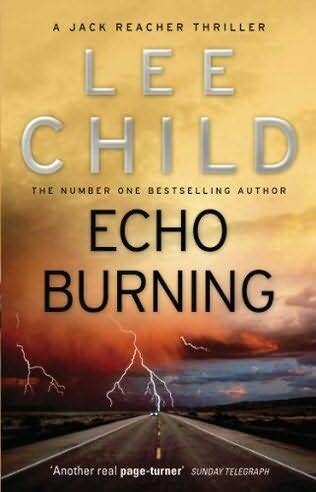 Echo Burning is by far the most boring and drawn-out Reacher book I've read to date. But, despite how slow it is, you'll probably still find yourself breezing right through it - at least I did. Although Child's prose is appropriately blunt and short given the action-packed fast pace of his novels, this one just seems to last a lifetime. With the exception of Reacher, the characters are annoying in this novel. Carmen's character is prissy and needy, and even the personality of Alice - Reacher's lawyer sidekick - seems stale and unlively. Also, Child makes far too many references to the sticky Texas heat, which begins to get irritating before Carmen and Reacher even make it to the small town of Echo, Texas. Even more irritating are the references to the unbelievable amount of non-working air conditioners everywhere Reacher goes. If this is Child's attempt at comic relief, he fails miserably. This is definitely the city-girl in me talking, but I find it hard to believe that Echo, even given its small population and economic status, has difficulty maintaining the air conditioners in every single building. As usual, Lee Child packs a bunch of smart red herrings and plot twists into Echo Burning. You'll go back and forth between deciding who you think is the real bad guy behind the chaos. But - when you finally get to the end of the book, you'll be glad the journey is over. Not one of Lee Child's best, but still a great read. That says a lot about Lee Child's talent as a writer, don't you think? Following Echo Burning in the Jack Reacher series are Without Fail, Persuader, The Enemy, and One Shot. Click on any of the images of the books below to review them in more detail on Amazon.com. What do you like most about the Jack Reacher series? Which book is your favorite in the series so far? Share your thoughts with us in the comments section below.